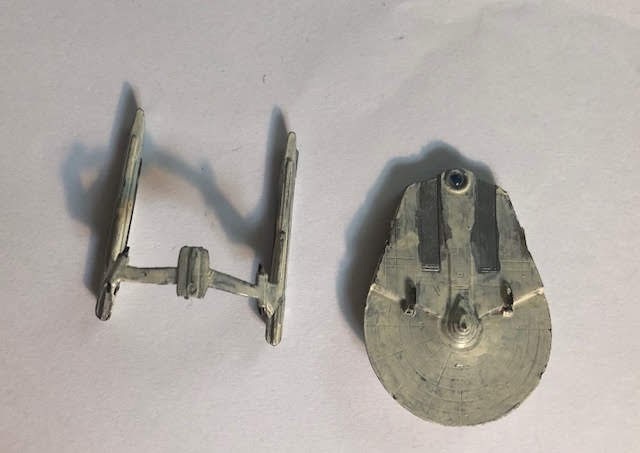 A few years ago I made a post talking about the FASA Star Trek Miniatures that I had bought years ago. 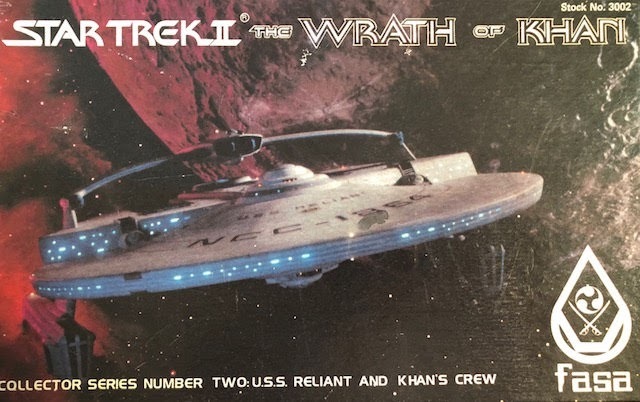 Of course, I wanted to get Khan and his crew to be antagonists for Kirk and the Enterprise crew. I knew that FASA had released a boxed set for Khan, the Reliant, and his crew that I've been looking to get for a long time now. Recently I found one that was in great condition which I've added to my collection. 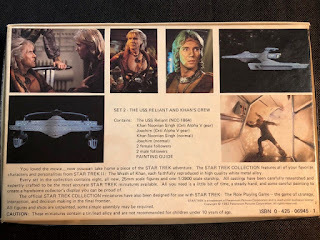 This box set comes with the U.S.S. Reliant starship, two different miniatures of Khan and Joachim (one is Ceti Alpha V gear and their normal bridge crew uniforms) as well as two female and two male crew members. 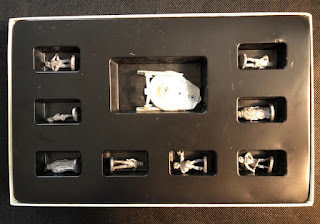 This box set that I bought came with all the miniatures and was just missing the painting guide and the Reliant's stand which I can easily get off of the Internet. 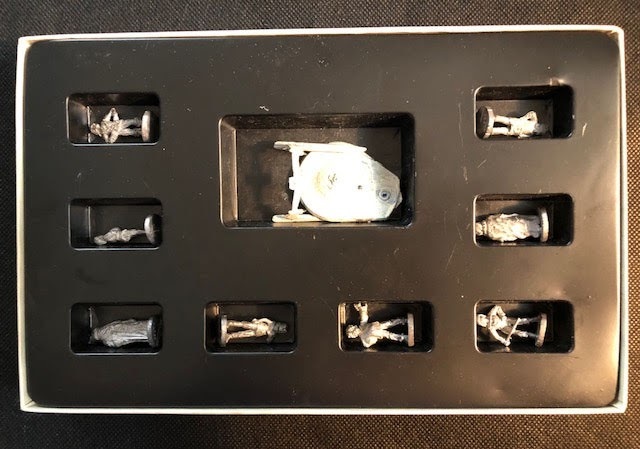 All of the miniatures except the Reliant are brand new with no paint applied to them so I'll be able to paint them up pretty quickly, I am also going to start painting the Enterprise bridge crew at the same time so I'll have both factions to play with. The only issue is with the Reliant because not only will I need to strip the old paint off but I need to fix the metal for the top piece that connects to the warp nacelles. The original owner, in his infinite wisdom, decided to roll that piece up. In the picture above I've bent it back to the correct position but it's a little bent still and I'm afraid to bend it too much for fear of breaking it. If I can't get it perfect I can live with it but I will probably keep my eye out for another one. 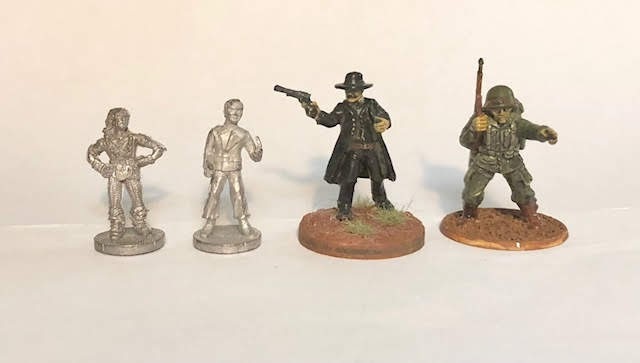 As I mentioned these are miniatures from the early 80s and are in the 25mm true scale which is are shorter than current 28mm scale. For the most part, I don't have a problem using 25mm -32mm on the same board. I have three brothers and I'm taller than them all with my shortest brother five inches shorter than me so a miniature of me would be taller than a miniature of him. The only place that this can be a problem is that gear like guns will usually be smaller at 25mm than at 32mm but again this is my game and If I want to mix the sizes of the minis I use I will. I'd rather be playing games than worrying about the minis scale being off. After waiting all these years to find a Khan box set I pulled the trigger and I'm glad I did. There is three more box sets out their including the Enterprise, Regula 1 space station, and a Klingon box. What I've come to learn is that there are two different variants of the main characters. The box sets come with one and the single blisters come with the other variants. I may try to collect them all but I may hold on while I build up my FASA starship collection. Overall I'm very happy with this box set and rate it a 7 out of 10.